Surfactants are necessary for the lathering, cleaning, and degreasing effects of a shampoo. Conventional surfactants such as sodium lauryl or laureth sulfate, ammonium laureth sulfate, cocamide DEA, and ammonium xylene sulfonate have the potential for harshness, stripping away fatty acids. The main function of preservatives is to ensure a long shelf life. None are truly benign. Conventional preservative such as iodopropynyl butylcarbamate, methylisothiazolinone, methylchloroisothiazonlinone, and parabens tend to be stronger, with more allergenic and irritant potential. In basic shampoos, color is added for decorative purposes only. Conventional colorants are often added, but are not necessary for a shampoo to function at all. Most natural brands do not even use colorants at all! It takes just a minute or two to give your hair a thorough washing, but when you multiply that by every day, or at least a few times a week, for a lifetime, it adds up to many minutes — and loads of exposure to the chemicals in your shampoo. 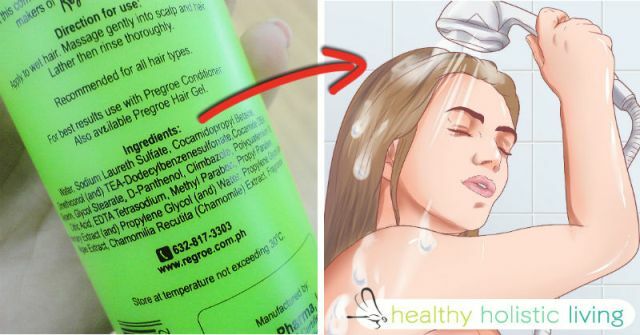 During that time, you want to be sure that the shampoo you’re putting onto your scalp is safe and non-toxic for your body, and this will take a bit of due diligence on your part because the majority of shampoos on the market are actually quite toxic. There are no federal regulations for beauty products, including shampoo, so it’s really a buyer beware market. Just what might you find in your favorite brand? Sodium lauryl sulfate is a surfactant, detergent and emulsifier used in thousands of cosmetic products, as well as in industrial cleaners. It is present in nearly all shampoos, scalp treatments, hair color and bleaching agents, toothpastes, body washes and cleansers, make-up foundations, liquid hand soaps, laundry detergents and bath oils/bath salts. 1,4 dioxane, a byproduct of ethylene oxide, received a “high hazard” rating from EWG’s Skin Deep, and it is commonly found in shampoo and other personal care products. Even baby shampoo often contains this cancer-causing toxin. On the CDC site, 1,4 dioxane is described as “probably carcinogenic to humans,” toxic to the brain and central nervous system, kidneys and liver. It is also a leading groundwater contaminant. In a recent FDA report, approximately 42% of all cosmetics were contaminated with NDEA, with shampoos having the highest concentrations. DEA also readily reacts with nitrite preservatives and contaminants to create nitrosodiethanolamine (NDEA), a known and potent carcinogen. This is a big problem because DEA seems to block absorption of the nutrient choline, which is vital to brain development. Pregnant women actually require extra choline so they can pass it on to their fetus. This active ingredient is found in engine coolants and antifreeze, airplane de-icers, tire sealants, rubber cleaners, polyurethane cushions, paints, adhesives, enamels and varnishes, and in many products as a solvent or surfactant. And guess what? Despite the fact the material safety data sheet warns users to avoid skin contact with propylene glycol as it is a strong skin irritant and can also cause liver abnormalities and kidney damage, it’s more than likely in your shampoo. Parabens, which are used as preservatives, may be listed on the label as methyl paraben, ethyl paraben, propyl paraben, butyl paraben, isobutyl paraben or E216. They have shown particularly troubling links to cancer. When you put shampoo or conditioner onto your scalp, the 20 blood vessels, 650 sweat glands, and 1,000 nerve endings soak in the toxins. The truth is, while you wouldn’t ever eat your shampoo, you may actually absorb fewer toxins when you eat something than you do when you apply it to your skin! According to evidence presented at 1978 Congressional hearings, the absorption of the carcinogen nitrosodiethanolamine (NDELA), which is commonly found in shampoo products, was shown to be more than 100 times greater when exposure came through your skin than via your mouth. The truth is, when you consume toxins in foods, such as pesticides in fruit and vegetables, the enzymes in your saliva and stomach often break them down and flush them out of your body. Food also passes through your liver and kidneys, so the toxins that make it through are detoxified to varying degrees by enzymes before they reach the remainder of your body. However, when toxins are absorbed through your skin, they bypass your liver and enter your bloodstream and tissues — with absolutely no protection whatsoever. What are Your Safer Shampoo Options? Daily use of ordinary, seemingly benign personal care products like shampoo, toothpaste and shower gel can easily result in exposure to thousands of chemicals, and many will make their way into your body and become “stuck” there, since you lack the means to break them down. So you will want to seek out pure and natural cosmetic products, and choose them carefully. One of the easiest ways to do this is to make your own personal care products using simple all-natural ingredients that you may already have in your home. Finding recipes for your own homemade beauty products is simple if you have access to the Internet — just Google “homemade cosmetics” for more than 400,000 pages of recipes and instructions. If you’d rather not make your own, the Environmental Working Group’s Skin Deep Cosmetic Safety Database is an excellent resource to help you find safe natural personal care products. A newer site called Good Guide is also helpful in finding and evaluating healthful, green products — both personal care items and food. I also offer a wonderful skin care line that includes an excellent shampoo and conditioner duo. A couple years ago, our team developed one of the few USDA certified organic skin care lines in the US. I am constantly amazed at the consistently good comments I receive from friends and relatives that I have given this to as a gift, and, of course, it is all natural. Look for products that are fragrance-free. One artificial fragrance can contain hundreds—even thousands—of chemicals, and fragrances are a major cause of allergic reactions.